I was looking for fitness challenge. I had already been running 5k races and had either won or placed in every race (6) within my age group, so I felt like I was ready for more. My mother suggested I race a half-marathon. Truly, running 13.1 miles sounded awful and I had no desire to run that far for pure enjoyment. Suddenly, I found myself logging longer runs on the weekends just to test my endurance. When early registration came for the Indy Mini Marathon, I went out on a limb and signed up. I had no experience with longer distances, but I learned a lot along the way. Below are some tips that helped me through the half-marathon training as well as some keys for a strong race. 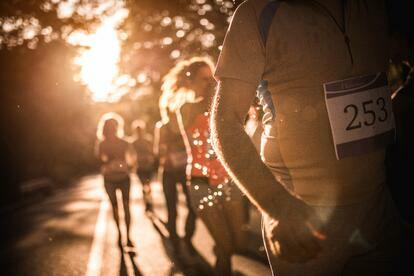 Give yourself enough time to prep for the event; remember, it’s a “marathon, not a sprint.” I recommend giving yourself 16-20 weeks of preparation for a half marathon, especially if it’s your first time running one. If you’re a seasoned runner you could likely get away with a 12 week plan. Research or have a professional design a training program that increases mileage each week. Throughout your training, you want to slowly progress and build upon the miles to increase endurance. Every fourth or fifth week, mileage should be reduced for recovery purposes and increased the following week to continue your journey. During the week (Monday-Friday) I did some speed work and concentrated on shorter distances (5-8 miles), and then I used one day on the weekend for a slower-paced long run (8-15 miles) in length. With two weeks remaining before your race, you want to slowly decrease the amount of weekly miles you're completing. The taper will give you the proper amount of time to recover so you're ready on race day. You can’t put cheap gas in a high-performance vehicle and expect it to perform well; neither can you expect that with the human body. Not only does your training have to be focused, so does your nutrition. Well-planned nutrition and meal-timing is key with half-marathon training. Pre- and post-run nutrition is important during training and on race day. Some foods may sit well with some people, but not so well with others, so you'll have to do some experimenting to find what works best for you. I would eat the same pre-training meal every day because I knew it settled well on my stomach, and I didn’t feel bloated or sluggish while running later in the day. My meals gave me great energy and gave me enough fuel to finish training sessions. Post-training hydration was a key in recovering as well. A couple days leading up to the race I would increase my carbohydrate intake. I did this to provide my body proper glycogen (energy) stores. I would continue to eat the same food sources, but only increase the amount of food and calories I was eating. The day before the race I continued with the same nutrition protocol, but I switched from a complex carb source to a simpler carb source to eliminate the fiber found in most complex carbohydrates. I also increased my hydration as well. I would consume food sources such as pasta and white bread with jam or honey. On race day, I would have a huge plate of pancakes from a “just add water” pancake mix and add a scoop of peanut butter 3-4 hours before. I wouldn’t count any of the calories in this meal. A lot of people think pancakes would not settle well but they actually do for me. They aren’t too heavy and I stick with a limited amount of sugar-free syrup. I would eat till I was satisfied, but not too full. About an hour before the race I would have a large Rice Krispie treat, and follow that up with 10-12 pieces of some sort of candy (Sour Patch Kids or Trolli Worms) 30 minutes before the gun was fired. Hydration was limited to 16 ounces of water from when I woke up to about 30 minutes before the race (I didn’t want to have to use the restroom during the race). I would just take small sips of water when I felt like I needed it. I would also keep about 10-12 pieces of candy in my pocket during the race for simple and fast fuel as the race went on, and hydrating only once or twice during the whole race at water stations. Running 13.1 miles is a great accomplishment if you ever get the motivation or desire to run that far. I found it to be a great challenge for myself. Since the 2017 Mini, I've completed another half marathon and I plan on running many more. Each race I have found is a learning experience. Find what you enjoy. Commit. Be consistent. Eat. Train. And Run!